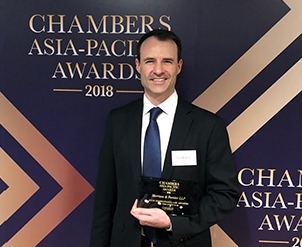 Morrison & Foerster was recognized as the Japan International Law Firm of the Year at the 2018 Chambers Asia-Pacific Awards, held in Hong Kong on February 1. This marks the sixth year in a row that Morrison & Foerster has received this award and the seventh time in the eight years that the award has been presented. Based on industry research and client feedback, the Chambers Asia-Pacific Awards celebrate the work of domestic and international law firms in the region. Firms are evaluated on the quality of their work over the past 12 months and their dedication to client service. Chambers recognized Morrison & Foerster as a leader in the M&A market, with demonstrated expertise in big-ticket, cross-border M&A transactions. Chambers noted that Morrison & Foerster’s dispute resolution team is known for its “speedy support” and “particular strength” in IP and technology disputes. Chambers recognized Morrison & Foerster’s “top-league” IP group known for its work across contentious and non-contentious issues, trade secrets disputes, and expertise in monetizing IP portfolios. Advised Mori Trust Co., Ltd. on establishing its U.S. subsidiary Mori America LLC to help the company with its overseas investment business in the U.S., marking the first deal for Mori Trust in the U.S.